Aguiar, A.P. 2004. 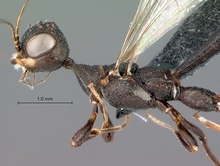 World catalog of the Stephanidae (Hymenoptera: Stephanoidea). Zootaxa 753: 1–120. Benoit, P.L.G. 1949. Les Stephanoidae (Hym.) du Congo belge. Revue de Zoologie et de Botanique Africaines 42(3–4): 285–294. Benoit, P.L.G. 1951. Les Stephanides Malgaches (Hymen.-Terebr.). Mémoires de l'Institut Scientifique de Madagascar. A5(2):269-284. Benoit, P.L.G. 1984. Stephanidae de l'Afrique occidentale et centrale (Hymenoptera). Revue de Zoologie Africaine. 98:215-228. Cameron, P., 1912. On the Hymenoptera from Belgian Congo in the Congo Museum, Tervueren. Annales de la Societé Entomologique Belge 56: 357-401. Ceballos, G. 1926. Estefanidos del Museo de Madrid (Hym. Stephanidae). Eos. 2(2):135-148. Elliott, E.A. 1922. Monograph of the hymenopterous family Stephanidae. Proceedings of the Zoological Society of London. 3:705-831. Enderlein, G. 1901. Neue Evaniiden, Stephaniden, Mutilliden (Apterogyna), Proctotrupiden und Chalcididen, mit einer Bestimmungstabelle der africanischen Stephaniden. Archiv für Naturgeschichte. 1(3):187-220. Engel, M.S. 2005. The crown wasp genus Electrostephanus (Hymenoptera: Stephanidae): Discovery of the female and a new species. Polskie Pismo Entomologiczne. 74(3):317-332. Engel, M.S. & Grimaldi, D.A. 2004. The first Mesozoic stephanid wasp (Hymenoptera: Stephanidae). Journal of Paleontology. 78(6):1192-1197. Engel, M.S. & Ortega-Blanco, J. 2008. The fossil crown wasp Electrostephanus petiolatus Brues in Baltic Amber (Hymenoptera, Stephanidae): designation of a neotype, revised classification, and a key to amber Stephanidae. ZooKeys. 4:55-64. Jurine, L. 1807. Nouvelle méthode de classer les Hyménoptères et les Diptères. 1. Hyménoptères. Geneva. J.J. Paschoud ed. 319 pp. (Ichneumonoidea in 1-51, 94-118, Index Alphabetcus, Tableau Comparatif, Pl. 1,2,3,8). Kieffer, J.J. 1904. Description de Stéphanides et d'Evaniides nouveaux. Bulletin de la Société d'Histoire Naturelle Metz (2e serie). 23(11):1-30. Morley, C., 1917. Some Stephanidae: with descriptions of new species. – Entomologist 50: 105-113. Morley, C. 1917. Some Stephanidae: with descriptions of new species. Entomologist. 50: 33-36.
van Achterberg, C. 2002. A revision of the Old World species of Megischus Brulle, Stephanus Jurine and Pseudomegischus gen. nov., with a key to the genera of the family Stephanidae (Hymenoptera: Stephanoidea). Zoologische verhandelingen 339: 3-206.
van Achterberg, C. & Quicke, D.L.J. 2006. Taxonomic notes on Old World Stephanidae (Hymenoptera): description of Parastephanellus matsumotoi sp. n. from Japan, redescription of Commatopus xanthocephalus (Cameron) and keys to the genera Profoenatopus van Achterberg and Megischus Brullé. Tijdschrift voor Entomologie 149: 215–225, Figs. 1–16. Westwood, J.O. 1874. Thesaurus entomologicus oxoniensis. Oxford. 205 pp. p. 128.